Who is using Tundras to tow with and what are you towing? Me!!! 2008 Tundra DC SR5 with tow package. Currently I tow a Flagstaff 21 FBRS. Previously I towed at 37’ Cougar Xlite. We just purchased another new to us 2016 Tundra Crew Max. We’ll continue to tow with the 08 for the next few years. I love our Tundra. I wished I’d gone camping sooner in life. Clifford is a 2011 crewmax that we have been towing our EVO 2850 with. We have overcome the hills out here in the west by adding an AFE intake and TRD dual exhaust. I have also added sumo springs in the rear and has greatly improved the loaded ride. 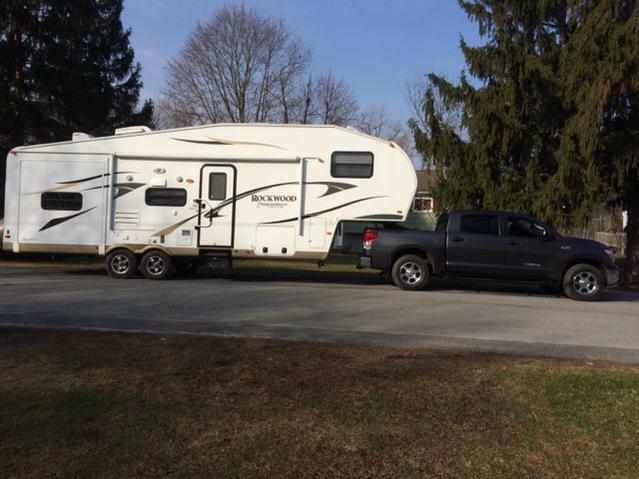 2014 Stealth Evo 2850- "Woodstock"
2011 Toyota Tundra Rock Crawler TRD 5.7- "Clifford"
2013 Honda Accord Coupe V6 w/Track Pack- "Julia"
I have a 16 dc and tow a 8311 Signature Ultralight. The longest trip so far was from Cincinnati to Cherokee NC. Our son pulled for years with Tundra. No problems with pulling within it's weight range. Lots of power. He loved that truck. The problem was horrendous fuel mileage empty or loaded. My old set up, worked great!! We had a '14 Tundra that we really liked. Problem was that the TT in the signature overloaded it even with just the two of us. As with most folks, we explored every avenue to avoid being overweight - all to no avail. Hence the Chevy 2500. 2007 Tundra with tow pkg. 5.8ltr long bed. Pulling 2018 hyper light bhhl. 24' Trailer pulls well with equalizer. Had a 1999 dodge with Cummins that I wore out at 165k miles. Got to where it was a 500.00 repair bill every time I used it. 3 sets of brake lines, shock mounts, shackles. replaced basically everything underneath that could rust away. When it came time for the 2nd set of fuel pumps and rails at 2700., I said that was enough.